I opened the packet and really took in the aroma. It had that Swiss Miss smell of Dutch processed alky chocolate and what I'd describe as a slight marshmallow scent. I usually eat my Pop Tarts raw. I found the cookie part to be more brittle or crisp. Usually "raw" Pop Tarts are doughy. Or at least the strawberry Pop Tart without icing is doughier. When I ate this Pop Tart raw, I thought about the name they attributed to it and I would say it's almost fitting. The chocolate flavor is little more "creamy" and you can image that there's marshmallows in it, even if your taste buds don't recognize a real marshmallow flavor. I found the swirls to be whimsical and maybe they did contribute to my enjoyment of the product. 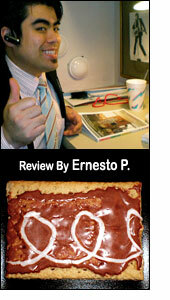 I had a sense that this was what a "homemade version" of the traditional chocolate Pop Tart. My only complaint may just be my preference. I don't generally care for icing on Pop Tarts for breakfast and this Pop Tart reminded me more of cookie or candy than something that should be eaten at breakfast. The flavor was definitely enhanced by the toasting process. The flavor at a higher temperature was a bit more reminiscent of Hot Cocoa. Of all the ways I tried them, I had the best results after I froze the box and then lightly toasted them when frozen. When frozen and eaten directly from the package, this Pop Tart is not particularly memorable. The flavor is subdued at a lower temperature - making it taste more like a traditional chocolate Pop Tart. For breakfast, this flavor is okay, not great. I see it more effective as a midnight snack - times when you just need chocolate and you're not too picky how you get it. I'm giving this product 6 Golden Eggs as a snack and only 4 Golden Eggs as a breakfast product. That equals a fairly respectable 5 Golden Eggs. Price reflects a box containing 8 Pop Tarts. 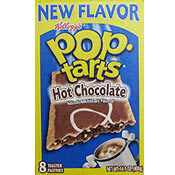 What do you think of Hot Chocolate Pop-Tarts? I can't find these anymore at stores in my area... however, it has not stopped me from looking every time I go. This time of year always reminds me of them. I LOVE THESE! Why have they disappeared off the shelves?! They are my favorite! Last year I was told they were seasonal so I bought all of them Wal-Mart had in their stock (on the shelf & in the back). It wasn't the best... till I taste better "strawberry" has my vote. I just wish I could still find these. It was alright I suppose, I'm currently eating one right now, but the only real reason I'm finishing it is because I don't want to waste it. This product I found to be delicious any time of the day. Of course, I have quite a sweet tooth. Is this really supposed to be a breakfast food! I lable it as DESSERT!! And it didn't even taste that different from any of the other chocolate ones! These didn't seem to be anything special to me. 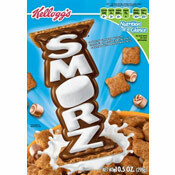 Tasted similar to a smore poptart to me (which I guess makes sense since smore poptarts consist of chocolate, marshmallows, and what I assume to be graham cracker "crust"). Didn't really wow me... just another poptart flavor. Hot fudge sundae poptarts, however... a little on the rich side, but in small doses... muy delicioso, si! Not that good. Just ok.